A new TV channel, Drama, has launched today, the 8th of July 2013. The channel promises to show best of British drama from the last 40 years, including popular UK drama series such as Auf Wiedersehen Pet, Lovejoy, The Bill, Taggart, Cranford, Lark Rise to Candleford, Jonathan Creek, Pride & Prejudice and Sharpe. There’s also comedy in the form of Birds of a Feather and Morecambe & Wise. 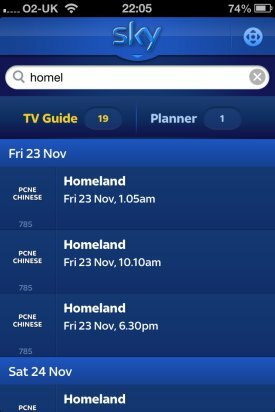 On Freeview, there has been a small channel renumber, with GOLD and Home (part of Top Up TV’s meager offering), having to move to further down the Freeview programme guide. In March 2013, our podcast team met up with the lovely Sue Holderness, better known to us all as “Marlene” from Only Fools and Horses. Here’s our interview with Sue, where she tells us about her experiences on the show, why it’s so fondly remembered, and whether or not Del will be returning to our screens. Will there ever be another series? Thanks very much to Sue Holderness for talking to our podcast team, and long man the series continue to entertain the nation. Happy 2013 everyone, and welcome to a new year! 2013 promises to be an interesting year for digital TV and radio in the UK, and as it’s the first day of a new year, it’s always good to take stock and see what’s happened in the last twelve months. If you’re new to our podcast, or maybe you’ve not even dabbled with podcasts before – it’s an online radio show that you can download and listen to at your leisure. We try to make our shows both interesting and informative, and we have a bit of a laugh along the way. Shows are free, and researched by the team here at Radio and Telly, so why not give FrequencyCast a try? You can listen online, or download our shows onto your computer, tablet, smartphone or mp3 player, and we’re also available on most streaming Internet radios. Check out the show, called FrequencyCast, at www.frequencycast.co.uk/latest.html. If you have an iPod, iPhone or iPad, you can get all of our shows for free from the FrequencyCast Podcast page on iTunes. YouView finally launches – just two years late! In our latest show, we also mention some Freesat and YouView news, plus answer questions on BT Vision and look at some stats on how the UK watches TV. 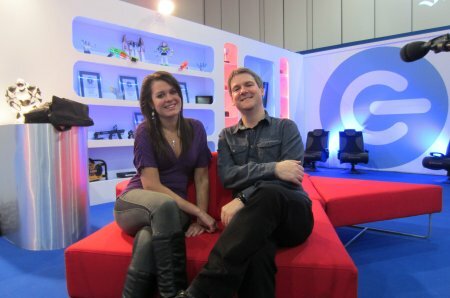 In previous shows, we’ve featured interviews and features on a range of topics including YouView, Star Trek, The Gadget Show, Freeview, Sky, amateur radio, sport, smartphones and local radio. We’d love it if you’d take a listen to Show 83, which is our look back at 2012. We’d love to know what you think, and we’d love it even more if you become one of the show’s regular listeners. Our team works very hard at creating these little radio shows, and we hope you like what you hear. Being able to use your Apple device to control your Sky box is a nice touch, but you’ll probably find changing channels and fast-forwarding is still quicker with your Sky remote. The real power comes in being able to see what shows you have recorded now, and what shows are scheduled for recording. This means you can manage your Sky box without having to be front of the telly, and also you can pick what to watch from a different room. 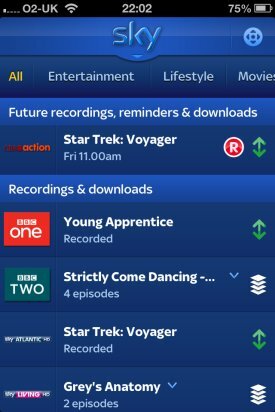 With the new Sky+ app, you can see what’s recorded and delete any old recordings. You can manage clashes, and start playback of a recording by pressing the ‘Watch’ button, and the show start to play on your telly. 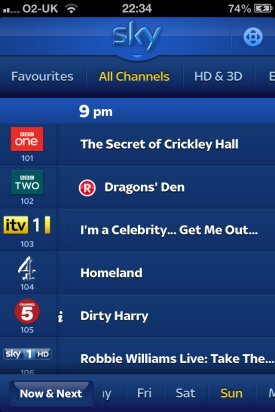 If you’re not sure what you want to watch, you can check out the new ‘recommendations’ feature, which lets you know what Sky thinks you’d like to watch, and tell you when they’re on, so you can set a reminder or record them onto your box. To install the free Sky+ app from the iTunes App Store. There are loads of the things now: including Sky Go, Sky Sports, Sky News, Sky Cloud WiFi, Sky Movies, Sky Bet, Now TV (Movies service) and even Sky Pro Cycling. Check them out in the iTunes App Store. 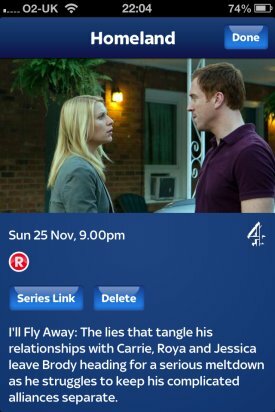 The updated Sky+ is a nice little app, adding some great additional functionality. Sadly, as the moment, the iPhone app doesn’t seem to display the grid in landscape mode. We’ve also been checking out some of the iTunes reviews, and there’s a sizable number of people not happy with the improvements, or struggling to get things connected. For us, it’s all working, and a nice improvement. The YouView service combines Freeview with a large library of on-demand content. With BT, you’ll get the Humax DVR-T1000 YouView box (normally £299) for free, subject to a £6.95 delivery charge and a £49 activation fee. You’ll get Freeview, Freeview HD, catch-up TV from the BBC, ITV, Channel 4 and Channel 5, plus a thousands of TV shows and movies “on demand” over your broadband connection. 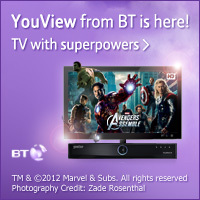 Get your phone, Internet and TV from BT, and you’ll get the YouView box thrown in. As mentioned above, a delivery charge and £49 activation fee applies. 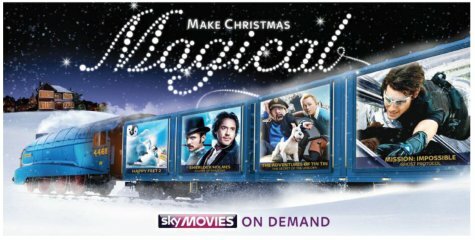 In addition, you need to pay for the TV service, which is either £4 a month for Essentials (the basic service), or £12.50 a month which gives you unlimited access to the online TV content as well as the Vision Movies service. 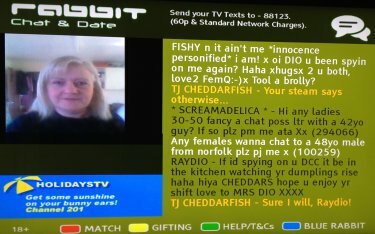 Currently you can go to the shops and get a YouView box for £299. Alternatively, if you get your broadband from TalkTalk, you can get a box from them… So why is the BT offering different? Sadly, what the service doesn’t yet offer, is Sky Sports, but we understand that’s on the way, along with other TV channels and content. 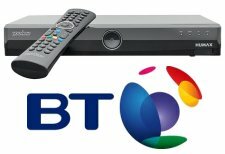 As you’re probably aware, BT has been offering BT Vision for the last 5 years. 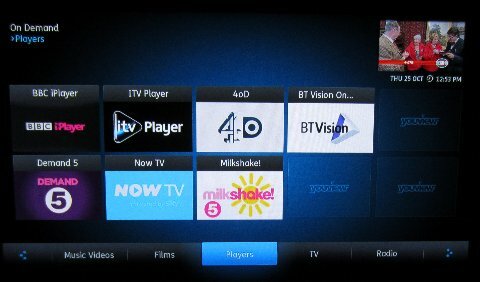 Does the new YouView service spell the end for BT Vision? Yes and No. Both products are available, with sport being the key service that makes the difference. It’s important to understand that “BT Vision” is now a part of BT’s YouView offering – BT Vision is the content, not the box, and from the YouView menu, you can access the BT Vision Player. It’s likely that BT YouView will offer Sky Sports content sooner rather than later, especially given BT’s recent purchase of Barclays and Aviva Premiership football and rugby rights. Once YouView can offers sports, the old BT Vision boxes will be phased out, with future effort being put into the new YouView platform.